Protected bike lanes are an easy way to improve the safety of cyclists. For the purpose to explore what might increase levels of cycling for transportation, the academic study FOUR TYPES OF CYCLISTS has been conducted by Portland State University. They interviewed adults in the Portland, OR region (USA) and found out that 84 percent of interested but concerned cyclists are concerned about being hit by a motor vehicle. It is their greatest concern and even greater than the fear of a stolen bike. 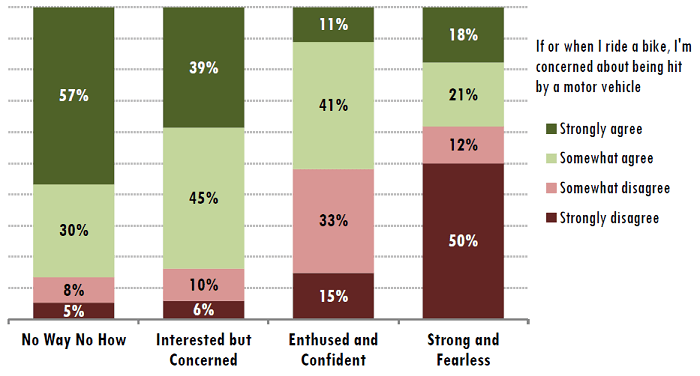 And still 39 percent of the strong and fearless cyclist type is afraid of road accidents. Indeed, in the first instance protected bike lanes prevent road accidents with personal injuries and material damages. This increased security in turn changes the behaviour and encourages people to choose the bike instead of their polluting car. Cyclists can drive with more pleasure and peace. 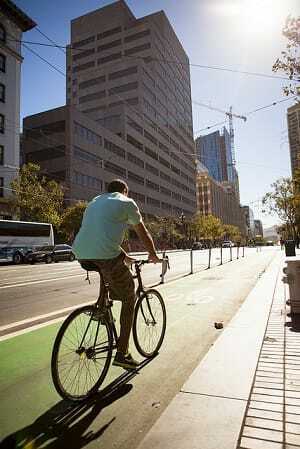 In the end, protected bike lanes reduce noise and air pollution as well as the demand of resources. 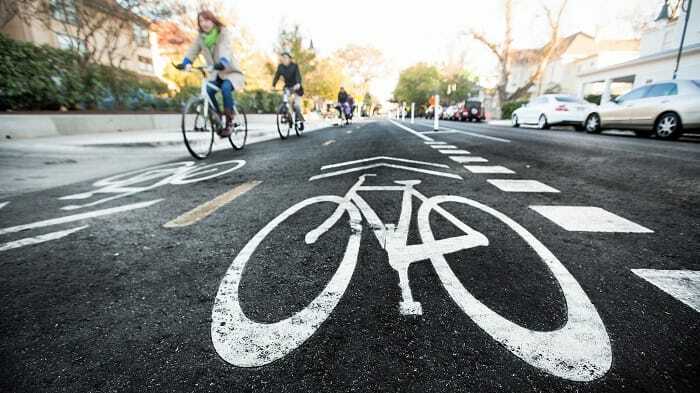 It is important that city planners and city leaders know the benefits of protected bike lanes especially if they are interested to increase the share of cyclists. Especially relating to commuters is a high potential to reduce car traffic in a city. And it is not a big deal to modify bike lanes. Many options require a little effort and are not very expensive. Protected bike lanes are not a multi-used path. The space is exclusively defined and allocated for people on bikes and separated from roads and footpaths. They should not be confused with red or green painted conventional bike lanes. Real protections are vertical objects and not just buffered zones. 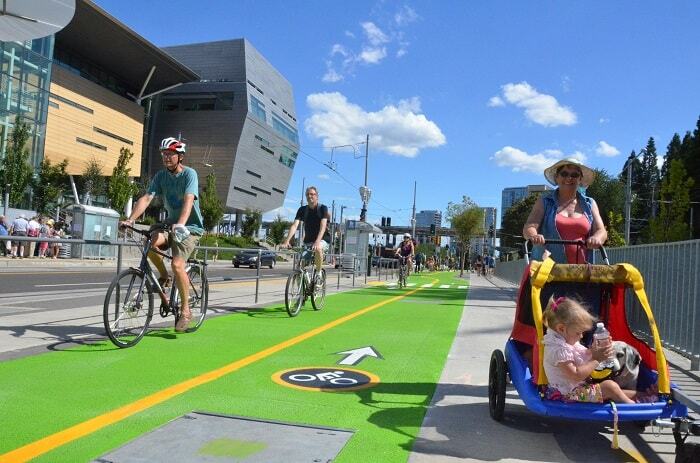 Do you have an idea about the different types of bike lane protections? The infographic “14 WAYS TO MAKE BIKE LANES BETTER”, provided by PeopleForBikes, introduces fourteen methods to physically separate bike and car traffic. As shown, there are plenty of opportunities to protect a lane. Depending on creativeness, they can characterise the street scene. The provided cost figures are based on various assumptions. The evaluation of aesthetic is naturally a matter of taste. In an internal memo from 19 October 2015, Portland’s policy announced that all city-managed streets with average daily traffic of 3,000 motor vehicles or more per day have to be equipped with a bike lane protection. Probably the first city in the United States with such an ambitious policy. As stated in the memo, Portland’s Bureau of Transportation expects that the share of bike transportation will grow the most. For this, safe and high quality bike lanes are needed.